I'm not a lifelong fan of the Ninja Turtles, but I certainly grew up during a time when they were impossible to ignore. Having enjoyed the original 1987 animated series during my childhood, my interest waned during the series' mammoth ten-season run; like most other TV shows (animated or otherwise), TMNT eventually became a watered down parody of its early years...which is ironic, since Kevin Eastman and Peter Laird's original comic book series spoofed popular titles like Daredevil. Even so, the franchise was unstoppable during the late 80s and early 90s, and perhaps never more than when the first movie premiered in the spring of 1990. I distinctly remember a mob of fans lined up around the theater on opening weekend, eager to catch a glimpse of their heroes on the big screen. It was a great movie and holds up pretty well today thanks to technical wizardry, terrific fight scenes and no shortage of cornball jokes. Surprisingly, things haven't changed much during the last three decades. TMNT is still enormously popular thanks to more recent efforts like Nickelodeon's excellent CG animated series, which might just be the best incarnation of the Turtles to date. Unless you lean towards one extreme or the other---that is, the darker mood of the original comics or the supreme goofiness of the '87 animated series, especially in later years----you're probably drawn towards that sweet spot of action and comedy. Most incarnations of TMNT have trouble hitting that spot just right: this is, after all, tongue-in-cheek source material that can't take itself too seriously...but a little darkness helps, too. Early seasons of the '87 series and the bulk of Nick's show have, thus far, been the most successful at treading that line carefully; others, like the third movie and The Next Mutation are either complete failures or oddball diversions. Long story short: the franchise's history has carved out several different groups of fans, and many of them will approach Jonathan Liebesman's Teenage Mutant Ninja Turtles (2014) with caution. Produced by Michael Bay (who, like Tim Burton in The Nightmare Before Christmas, may very well be mistaken for the director), this latest big-screen adventure offers yet another retelling of our heroes' origin and battle with Shredder. Like most comic book adaptations in recent memory, this blend of live action and CGI aims for a gritty, realistic atmosphere told from a human perspective. Its closest cinematic cousins are Batman Begins, Godzilla (2014), and Michael Bay's Transformers. 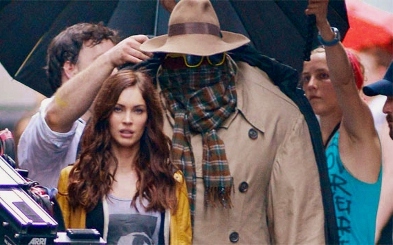 Our human perspective once again comes in the form of April O'Neil (Megan Fox), who works with Vern Fenwick (Will Arnett) at Channel Six News doing dull human interest stories...until one day when she discovers mysterious vigilantes fighting back against the deadly Foot Clan's crime wave in New York City. She eventually meets them on a rooftop and remembers their names---Leonardo, Michaelangelo, Donatello, and Raphael---as identical to four pet turtles she had as a kid in 1999, which makes me feel really old. 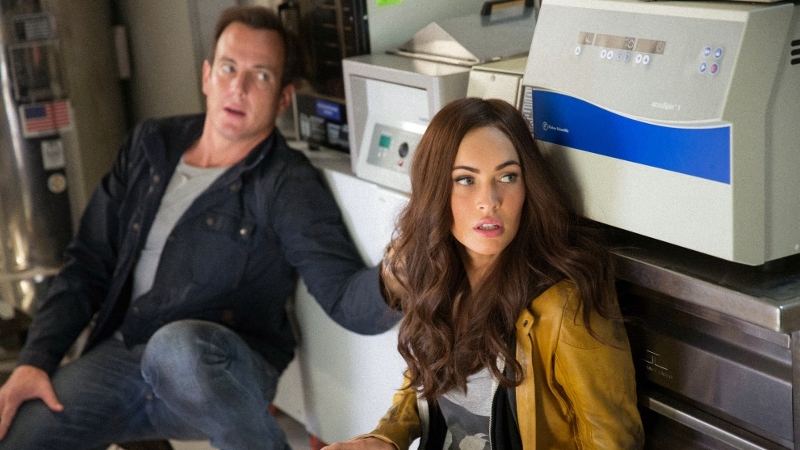 Soon enough, she pieces together their accidental creation at the hands of her father (Paul Fitzgerald) and his partner Eric Sacks (William Fichtner) as part of Project Renaissance, a top-secret experiment using mutagen as a healing agent. Either way, she's up against a lot: no one believes her story (which predictably leads to her flying solo, although Vern provides some assistance), the Foot Clan and Shredder (Tohoru Masamune) are still terrorizing the city, and even a few good guys turn out to be...not so good. Either way, what's here is pretty paint-by-numbers as far as narrative goes. You'll probably guess many of the twists far in advance, roll your eyes at some of the cornball jokes, and marvel at the film's slick CGI effects and motion capture technology, even though Jim Henson's puppet suits did a good enough job almost 25 years ago. I'll admit that one of the film's greatest strengths is that it moves briskly enough at just over 100 minutes: it doesn't wear out its welcome like Transformers and it's not nearly as headache inducing. But it's not a great movie, unless you're approximately 13 years old or have a reasonably short attention span. Still, I'd imagine that the parents of said target market will want to check it out for themselves...and from that perspective, this isn't a bad rental but hardly something you'd watch and enjoy more than a few times. But it doesn't matter, because Teenage Mutant Ninja Turtles sold enough tickets to guarantee at least two sequels in the years to come. Cowabunga, I guess? Not surprisingly, Paramount has served up a pitch-perfect visual presentation that, given the proper setup, rivals a theatrical experience. The film's heavily saturated color palette looks accurate, black levels are deep, textures are strong, and almost every sequence has an incredible amount of depth and detail. Digital imperfections---including excessive noise reduction, edge enhancement, and compression artifacts---don't seem to be an issue at all, which should please those with sharp eyes. 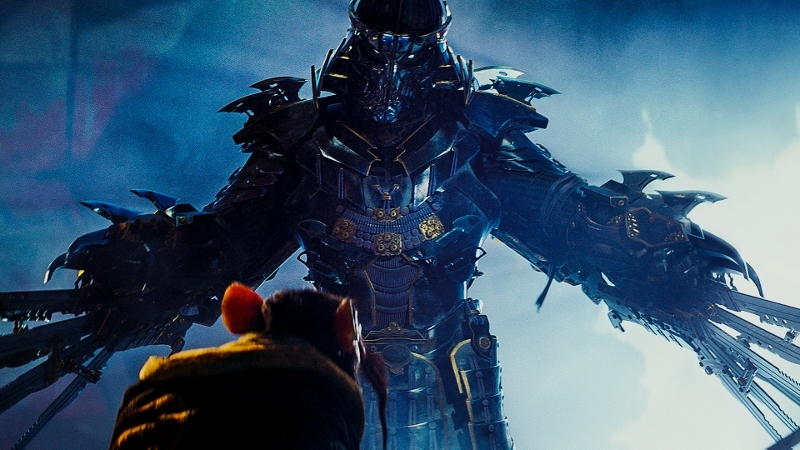 The film's extensive CGI also blends well with the practical effects. Overall, this is a visually stunning presentation from a studio with a strong track record for new release Blu-rays, and I'd imagine that new and established fans will appreciate the effort that went into this reference quality disc. DISCLAIMER: These compressed and resized promotional images are decorative and do not represent the disc under review. Likewise, the film's room-shaking audio achieves sonic perfection during the bulk of its running time. 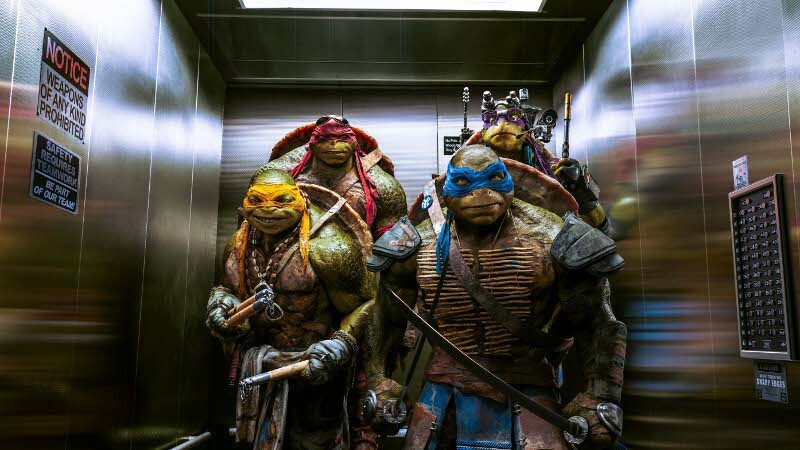 Teenage Mutant Ninja Turtles arrives with a default Dolby Atmos mix (which translates to Dolby TrueHD 7.1 for 99.9% of folks out there, including myself) that creates a consistent and compelling atmosphere...especially once the action heats up. Other moments also shine, as music cues and subtle background noises are also well-placed and effective without fighting for attention. LFE is also quite strong at times, as well as overall channel separation and directional effects. Simply put, this is one fine-sounding disc that really swings for the fences, and your neighbors will hate you for it. Optional Spanish, French, and Portuguese Dolby Digital 5.1 dubs have also been included, as well as optional subtitles (in the same languages, plus English and SDH captions) during the film and all applicable bonus features. The basic film-themed interface is smooth and easy to navigate on Blu-ray and DVD with separate menus for audio/subtitle setup, chapter selection, and bonus features. This two-disc set arrives in a standard dual-hubbed eco-friendly keepcase with a matching slipcover, a promotional insert, and a Digital Copy redemption code. Perhaps even less surprising than the slick, razor sharp visuals and dynamic audio presentation, this disc serves up a middling, surface-level batch of bonus features that digs no deeper than the movie does. 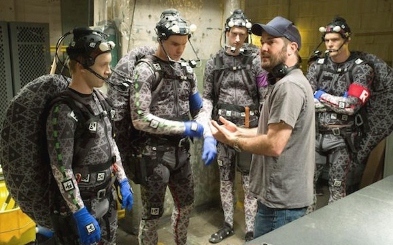 The main attraction, so to speak, is a collection of five Featurettes that covers a few basic aspects of production. "Digital Reality" (18 minutes) is the best of the bunch and includes a look at the extensive pre-vis process, digital composites, other special effects, fight sequences, and more. "In Your Face!" (4 minutes) briefly covers the process of shooting for 3D and might as well have been exclusive to the 3D release. "It Ain't Easy Being Green" (7 minutes) is a brief retrospective look at the franchise featuring cast and crew memories. "Evolutionary Mash-Up" (15 minutes) offers a quick run-through of turtle biology, ninja history and the like, while "Turtle Rock" (6 minutes) sits down with composer Brian Tyler. Closing things out is an Extended Ending Sequence (less than a minute), as well as a horrible Music Video (3 minutes) for "Shell Shocked" and a brief Making-Of Featurette for the same video (2 minutes). Optional subtitles are included for all applicable extras...and from top to bottom, this disc absolutely reeks of a "future double dip". But if you're like me and couldn't care less about most of these extras, I doubt more would sway your opinion of the film. 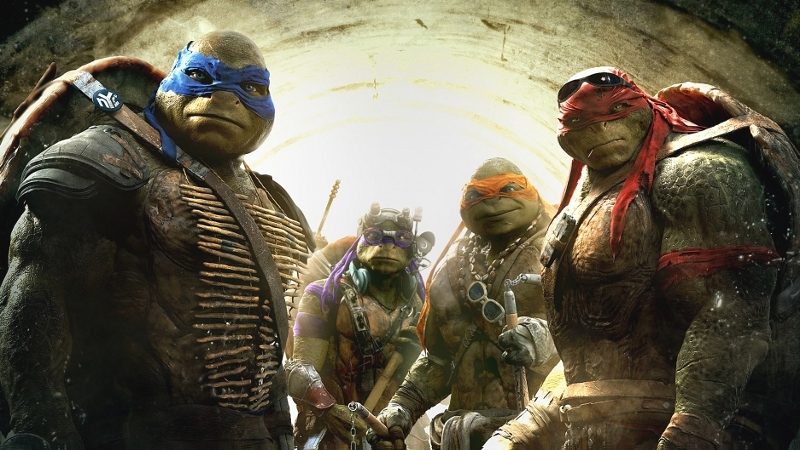 Teenage Mutant Ninja Turtles is...okay at the most, but often falls victim to "style over substance" like just about everything else associated with director Jonathan Liebesman and producer Michael Bay. It's exciting to look at, many of the fight and action scenes are sharply choreographed, stuff blows up real good...and you'll probably forget most of it the next day. Long story short: it's better than every Bay-directed Transformers movie (except maybe the first one), and that's not saying much. But regardless of how you feel about the film itself, Paramount's Blu-ray combo pack delivers big-time in the A/V department and it'll push the limits of most home theater setups. The extras, however, leave a lot to be desired and I'd imagine a fancier edition will arrive within the next year. Mildly recommended for those who enjoyed this in theaters, but everyone else should dip their toes in the water first. Rent It.